One of the most famous images of Maximón is found in Santiago Atitlán. 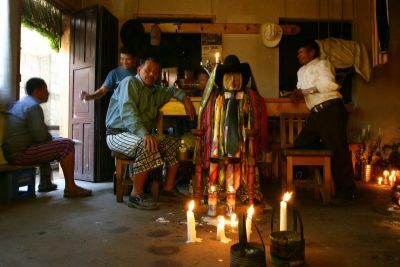 Maximón (also known as San Simón) is a widely known folk saint from the highlands of Guatemala. A highly ambivalent figure with connections to pre-Hispanic gods as well as Judas Iscariot, Maximón figures prominently in the modern Maya pantheon. He is primarily consulted by costumbristas on matters of money, healing and safety on the road, but he is also called on for many other purposes and his images continue to draw tourists in towns scattered throughout the Guatemalan highlands. Maximón did not appear in his modern incarnation until some time after the Spanish colonization of Guatemala, but his roots reach deep into the history of Mayan culture. disposition - must come to him with faith and he will provide. This page was last modified 09:48, 8 June 2009.